Pioneer RMX-1000 Remix Station 1000 DJParts - All Variety of Parts that DJ Needs. RMX-1000 Remix Station is an innovative technologically advanced device for enhancing DJ performances with its ability to create and add a variety of new and unique remix effects, as well as rhythmic sampling capabilities. 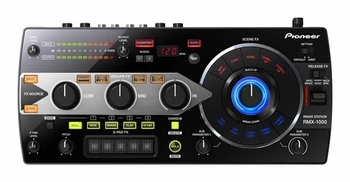 The RMX-1000 incorporates four remixing functions: Isolate FX, Scene FX, X-Pad FX and Release FX for simple musical arrangements with intuitive control, all accessible at the user’s fingertips. The device includes Pioneer's remixbox™ editing software to enable users to customize almost every function and feature of the unit. The system can also act as a USB controller when used with the included VST/AU/Pro Tools RTAS RMX-1000 Plug-in software. The compact and portable RMX-1000 allows users free control of musical developments with intuitive operation. Four sections of the device are arranged with easy-to-control knobs and buttons that control multiple effect parameters. By combining the effects from each section, wider arrangements with greater individuality can be performed with ease. The RMX-1000 is available in two color variations: RMX-1000 in black and the RMX-1000-W in white. Scene FX In the Scene FX section, users can choose between five Build Up effects and five Break Down effects. The Build Up effects, consisting of BPF ECHO, ECHO, NOISE, SPIRAL UP and REVERB UP, add sounds, while Break Down effects, consisting of HPF ECHO, LPF ECHO, CRUSH ECHO, SPIRAL DOWN and REVERB DOWN, cut sounds. A large knob increases or decreases the parameter of effects chosen by simply turning the knob. Two sub-parameters knobs are also available for additional changes to the effects being produced. Isolate FX The Isolate FX section, consisting of three individual knobs, processes the low, mid and high frequency bands of the music passing through. The section is loaded with three effects in addition to an Isolator, providing rhythm patterns, timbre, etc., letting users freely modify the output for the HI/MID/LOW frequency bands. In addition to the Isolator, three additional effects in the section are available including CUT/ADD, TRANS/ROLL and GATE/DRIVE. X-Pad FX The device features a touch pad section called the X-PAD FX that enables users to develop and add new sounds not found in the original music. In addition to its four built-in audio samples, KICK, SNARE, CLAP and HI HAT, other audio samples edited in Pioneer’s remixbox software can be loaded using an SD card (not included) during DJ play. Release FX The system also includes a Release FX lever that allows you to re-set and override current music playing. Release FX can also be used to create the opposite effect: When the lever is released, all section effects are eliminated while the original music continues to play. Three types of Release FX are available including Vinyl Brake, Echo, and Back Spin. Customization Using Remixbox Software The included remixbox software allows the user to customize various settings of the RMX-1000 on a computer, changing parameters such as volume output and values for different sections of the device. The customized settings can then be transferred using an SD card for use with other RMX-1000s. Studio Music Production using Virtual Studio Technology/Audio Units/ Pro Tools RTAS Plug-in By using the included RMX-1000Plugin VST/AU/Pro Tools RTAS plug-in software, users can create the same type of music production and effects while DJing on a computer. In addition, connecting the device to a computer enables it to act as a controller for music production.